How much voltage/current is “dangerous”? Safe current/voltage limit for human contact? 1.5 V can indeed be quite shocking with enough current (fell for one of those "Do you want some gum?" tricks back in high school...), but they sometimes do not use 1.5 V with the low amperage levels, some use a DC motor to vibrate and complete the trick. So I guess there's two parameters here, voltage and current... but are there rough numbers on how much of each (or in combination, which I guess would be power) would be considered hazardous? No old telephone lines have always been 48vDC well at least since from 1950s, if your skin is wet you can feel it slightly, like on your forearm. Now the ring voltage is 90-110vAC with a 2 on 4 sec off cycle (USA). It will ring your bell but good, should you be touching the wires when someone calls. The ring voltage rides on top of the 48vDC, so its present on the same two conductors that the voice voltage(DC) is on. Luckily it's 4 seconds off will give you a chance to get off the conductors with a scream (of pain). How much voltage is dangerous is not really a static number as it depends on your body resistance, time of exposure and source "stiffness" (i.e. how much current it can supply). You get figures like 60V (or as low as 30V) which are an attempt at an average figure above which "caution should be taken". However, depending on how "conductive" you are at any one time, sometimes e.g. 50V might be quite safe and other times it may kill you. You can see that as low as 20V may be dangerous given the right conditions. Here is the reference the tables came from, I think it is quite accurate based on some experiments I have done myself measuring body resistances. The rest of the site seems to be generally very well informed and presented from the bits I have read, so I think this may be quite a trustworthy source. 12 VDC CAN kill and has killed people. While 12V is almost always safe, worst case situations can and have lead to death. Mechanism may be ventricular fibrillation BUT paralysis of the respiratory muscles occurs at about 20% of the current needed to introduce fibrillation. See discussion and references at the end of this answer. 12 VDC applied across the chest has killed volunteers despite medical experts standing by !!! (From memory - volunteer prisoners participating in medical research). Carry a car battery with exposed terminals on a hot day when you are sweating and press the terminals to your body (as could happen worst case when lifting the battery etc) and you may end up repeating the experiment. Once conduction into the body starts you get a very low impedance / resistance circuit into what is essentially a large bag of dilute saline solution. There are two mains "what kills" issues. Enough current for long enough to stop your natural heart rhythm and throw it into fibrllation. At typical domestic voltage levels you are USUALLY safe if the current flows for well less than one ventricular heart valve cycle and at "low enough" current. Earth leak circuit breakers (ELCB) also called ground fault interrupters (GFI) and other names aim to trip at currents somewhere under 10 mA and from memory (references later - rushing) in about 10 mS = well short of a heart cycle. A shock from a circuit protected with an ELCB / GFI device will be felt but will USUALLY not be fatal. A 9v battery on the tongue almost certainly won't kill. A 9v battery across the chest with saline solution (or sweat) just might - probably not. A 12V "car battery" or any high current source from a few volts up MAY kill in the very worst case. Hand to hand I havve never heard of shock occurring or being felt. 110 VDC (not AC) routinely killed Edison's linesmen. 75 VAC imposed on 50 VDC gives a very nasty shock sometimes. Worst case this could kill. High current 1200 VDC hand to body somewhere may not kill - I'm still alive. Data point: Note that this is a completely true and non-fabricated account. I have a friend (still alive) who built a lamp to take flounder fishing. It used a 12V SLA battery and an Aluminum pole with the light at the top. Flounder fishing involves wading through shallow salt water. In the course of fishing he discovered that an electrical fault existed - in some manner he was exposed to 12 VDC between his hand holding the pole and the water he was standing in. He was completely unable to release his grip - the current flow exceeded his "let go" threshold. regardless of how "worst case" this may have been and what various tables and standards say, it was clearly possible to reach his personal can't-release level. The literature states that respiratory paralysis can occur at currents not significantly greater than the can't release level. If he'd been by himeself (never a wise idea with such activities) he may have found himself floundering :-). Note that this was a hand to leg current path. Chest to chest worst case can be reasonably expected to be potentially higher. The table below is from this page. this is not a primary reference source but the figures used have been obtained from an "official" source. See above page. Note that for 60 Hz Ac ventricular fibrillation is stated as occurring at 100 mA but paralysis of respiratory muscles occurs at 20 mA . These limits are very much user and situation dependant but give an order of magnitude indication. With very informal equipment I measured 1500 ohms resistance across two areas on my abdomen. I decided not to measure across my chest in the vicinity of the heart. I used flat contacts with no skin penetration. At 12V, if resistance did not change with current flow (and I'd expect it to probably drop) a current of 8 mA would be produced. Measurement with skin penetrating electrodes may reasonably be expected to increase this significantly. A superb discussion of electrical safety, current levels in various situations and consequences can be found here. The writer's competence and bona fides are above reproach*. The discussion relates to the provisions of standard IEC60990 'Measurement of touch current and protective conductor current'. This is a "for money" standard that I do not have access to, but excerpts from it are provided in the above reference and elsewhere. '*' P E Perkins PE. Convenor IEC TC108/WG5, IEC 60990 'Measurement of touch current and protective conductor current"
In worst case situations it could happen. Accounts of two deaths by electrocution. One at 12V. One at 24V. Note that BOTH these are unsupported heresay reports and actual cause of death may not have been electrocution. 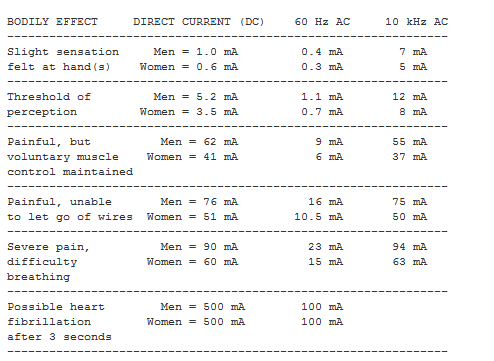 16 mA Maximum current an average man can grasp and "let go"
* Contact with 20 milliamps of current can be fatal. As a frame of reference, a common household circuit breaker may be rated at 15, 20, or 30 amps. Interestingly - this answer has 1 downvote, and surprisingly few upvotes considering the undoubted truth it tells. Maybe the downvoter and anyone who doesn't think it is a good answer would like to tell me why? The aim is to be balanced and objective and as factual as possible. If it falls short please advise. It's not the voltage but the current that kills. About 60V is considered the level at which you can start getting an electric shock. In general, for limb-contact electrical shocks, accepted rules of thumb are: 1-5 mA is the level of perception; 10 mA is the level where pain is sensed; at 100 mA severe muscular contraction occurs, and at 100-300 mA electrocution occurs. Electrocution becomes fatal when the current passes through the heart and causes fibrillation - the current causes the heart's beat to get out of sync and it can't pump blood any more. It's not the voltage but the current that kills, is a popular yet still incorrect incomplete answer. It is the ENERGY that kills. With static electricity you will will be exposed to voltages much, much, much higher than 110/230V and that is not dangerous. So obviously high voltages are not that dangerous in some cases. Why? Because the time is so short that the total energy you are exposed to is so low. Please see the video It's not the volts that kill you, it's the amps at youtube that explains this topic in more detail. Electrical current will cause muscles to contract and can lead to respitory and cardiovascular seizures. The electrical energy imparted on the body will burn and cause serious internal injury. But this only holds true for a given voltage, a certain voltage is needed to traverse the skin and this of course is a function of the impedance. For example the 9V battery on the tongue gives a slight shock but you wont feel anything if you hold the battery in your hand. The rule of thumb is 50 VAC or 120 VDC is considered the danger limit, take these as guidelines as the limits will change with humidity and other environmental factors. Whether or not these voltages are lethal really depends on the situation. For example, if you are working inside and power cabinet and you touch 1000 VAC with your elbow resting on the earthed shell, you will most likely BBQ your forearm and need an amputation. Do the same thing with 1000 VAC in your left hand and earth in your right hand and its game over. I agree with the other answers about that is the current that kills, but most off the other answers forget that the internal resistance of a body is not constant. How big is the body, a child, a small woman and a big man do not have the same mass. Contact area, i.e. how moist is the skin and how thick is it. How far shall the current travel in the body, longer distance means higher resistance (just like any other cable out there). So there is a big difference if you have 2 wires connected directly to your chest or if one cable is attached to your hand and the other to your foot. Then with this input you can calculate how big the current will be at the different voltages. Once, I connected output of a transformer to a voltage doubler to obtain 65V DC voltage. When I touched it with my two hands, it didn't shock me, it didn't even made me feel it. If I hold my breath and stay really calm like a training Buddhist monk, I barely felt a very tiny vibration at my fingers. I didn't measure current then. I am a male with an average body, and my hands were not dirty at that time. I have built a single-pulse high voltage source that charged a 6 uF capacitor to 600 Volts and discharges it through a transformer's primary winding so that it's about 30 kV at the secondary. I got a shock from it through a 1 cm air gap, and it caused me to lose hearing and vision for a few seconds. Fortunately both recovered completely, but it was scaring even to switch this circuit on. I was lucky not to have bought a 400 uF capacitor battery for that voltage. I don't think the voltage means much above a certain threshold, but the energy does definitely. Not the answer you're looking for? Browse other questions tagged voltage current safety or ask your own question. Current kills, but is voltage important? Who is responsible for Electrical shocks, high current or high voltage? How much current does it take to injure me? Safe current limit for human contact? Is 20 watts of electricity dangerous? How much current can Solderless Breadboards handle? Small overdose in current — dangerous? Is a device with high voltage and low current safer than a device with low voltage but high current should you accidently bump into the +/- pins? if voltage is too high but current too low, then is it dangerous for humans? If LEDs in a series begin to lose intensity and die is it too much voltage or too much current? How much current and voltage should be flowing back into my battery?